Where is the proof that CO2 warms the Earth? A persistent element of the climate debate is the claim that "there is no proof" that CO2 and other greenhouse gases warm the atmosphere. This has generated a number of amateurish demonstrations of how the greenhouse effect works A good example of how NOT to carry out such a demonstration is shown above. Nobody told this poor kid how to perform a scientific measurement. If he had switched his jars he would have discovered that the effects he observes are only the result of one of the two jars being closer than the other to the light source. And they didn't even explain to him how the greenhouse effect actually works: you cannot see any warming in this set-up unless you place a light adsorber (e.g. a piece of black cloth) in the jar. I discuss this and other disasters in a post of mine (in Italian), see also here. Imagine that someone asks you to prove that the Moon orbits around the Earth because it is pulled by the force of gravity. Your first reaction would be to say something like "huh?" But - assuming you are in a good mood - you might try to explain how Newton's law of universal gravitation works and how it can be used to describe the moon's trajectory. "So," your opponent could say, "is it correct to say that nobody ever measured the gravity pull of the Earth at the Earth-Moon distance?" "Aw... No. What for? It would be terribly expensive. And useless, too." "Then, you have no proof that the Moon goes around the Earth because of gravity. So, can you prove that the Moon is not being pushed by invisible angels, instead?" That would end the civil conversation, but there is some logic in this kind of questions. You can't reproduce the Moon's motion in a lab, here on the Earth. Instead, to prove that Newton's law is valid you create a model based on the law and then use it to describe the movement of moons, planets, and stars. The model works, hence the law behind it is correct. No need of measuring the Earth's gravity pull at the Earth-Moon distance (and no need of invisible angels pushing). Now, let's translate all this to a question often asked in the climate debate. What proof do we have that greenhouse gases, and CO2 in particular, warm the Earth's atmosphere? As a question, it is similar to the one about the Moon orbiting the Earth, in the sense that we can't reproduce the properties of a whole planetary atmosphere in the lab. To answer the question, we can start from laboratory experiments showing that CO2 absorbs infrared radiation - they were done already by Tyndall in the 19th century. We don't need amateurs today to remake those experiments, doing the job poorly. Then, we create models that describe the Earth's atmosphere and we use them to fine-tune the parameters of the warming effect. The models follow reasonably well the warming trends of the past so that we confirm that CO2 warms the Earth. In addition, we even have direct experiments showing that, as the atmosphere warms, more infrared radiation is radiated to space, while at the same time less infrared radiation escapes at the wavelengths where CO2 absorbs radiation. It is what we expect a greenhouse gas should do. Case closed, then? Not really. The Moon-Earth system is relatively simple and, unless you really want to believe in invisible angels, there is no doubt that the Moon is kept in its orbit by gravity, and by gravity only. Instead, the Earth's ecosystem system is a tangle of subsystems interacting with each other in ways that - in many cases - we have troubles in quantifying exactly. Newton could never have described the Earth's atmosphere by means of a single universal equation. So, how to disentangle the various contributions to the Earth's temperature: albedo, atmospheric particulate, vegetation cover, and more? This is the task of models, coupled with various kinds of measurements. For what we can say nowadays, the rising CO2 concentration is the main factor in the observed warming, but that's subjected to changes and refinements as we have new data. Among other examples, a very recent paper appeared in Nature quantified the effects of the vegetation cover. This is mainly a local effect and changes little to the overall picture, but it shows how dangerous it can be to say that "the science is settled." Of course, that doesn't mean jumping to the conclusion that angels are warming the Earth with their breath. And it doesn't mean to engage in silly games of data torturing. It just means recognizing the complexity of the problem. Then, there is an even deeper problem: complex systems such as the Earth's ecosystem are just that: complex. They may react to perturbations in a strongly non-linear way, amplifying or dampening the perturbation. In a complex system, it is always difficult to say what causes what. You can say that in a complex system there are no causes and no effects, only forcings and feedbacks. So, when people say that the increase in CO2 concentration is not a cause but an effect of global warming, are they wrong? Yes, they are basically wrong, but it is also true that increasing concentrations of greenhouse gases may be both a cause and an effect of global warming. Complex systems are dominated by feedbacks. And that means they can amplify the effect of a small forcing, turning it into a disaster. This is, by the way, the origin of the "Seneca Effect"
In the end, it all means that we have to recognize that the Earth's climate could react to perturbations in ways we can't even imagine. And more than seven billion humans on the planet have been a huge perturbation, no matter how we want to see the relative importance of what we have been doing. We ignore that at our risk. I agree entirely with Dennis Meadows that climate change should be regarded as a symptom or complication or side effect of our overshoot. Climate chaos will relentlessly worsen to become the worst problem threatening our very existence, but it is not the core problem. Furthermore it is not the most urgent problem right now. Despite many areas having been hit by severe weather events, global industrial civilisation is not immediately at risk of being brought down by climate change 1. Financial and economic collapse, which are intimately linked with the depletion of “easy” (high EROEI) oil and the looming net energy cliff (which will cause all resource outputs to fall off their respective Seneca cliffs) are much more immediate threats. 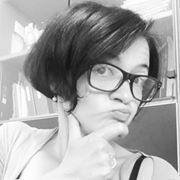 Nevertheless I do support those who protest against Adani and CSG in Australia, DAPL and Keystone XL in the US and new coal or unconventional oil and gas developments in general, because of the contemporary environmental vandalism wreaked and future carbon emissions released which may be the critical determinant whether we go extinct or not. However civilisation is doomed even if we cease all carbon emissions now, due to the extant GHGs and the numerous unstoppable adverse feedback loops already underway, which will destroy our capacity for large scale agriculture. Cities (defined as dense urban concentrations) are the basis for civilisation and cannot exist in the absence of large scale agriculture. There may be some hope for small scale permaculture in future residual climate resilient pockets (eg South Island of NZ, the southern tip of South America – a good jumping-off point to a thawing Antarctica), even as the rest of the world burns. Any competent Physician will tell you that a disease can only be cured by eliminating the underlying cause. Managing symptoms is important but is only a temporary fix at best. Unless the underlying cause is treated, there will be no cure. THF = total human population x (individual consumption + waste production) 2. This begs the question: if our THF is the core issue, are there even more fundamental root causes for this core issue? Only latterly did Il Papa come out stating that humans need to exercise responsible custodianship over our natural world or face catastrophe. Hey Pope! Your words were too little too late! And where did you get your ideas from? Did they come from an undetectable deity who telepathically beamed his thoughts into your brain from dimensions unknown, or did they come from reasoned conclusions derived from decades of peer reviewed scientific research conducted by mere humans? And what about population control and reduction huh? Huh? Per favore potresti spiegarmi. Religious justifications for our historical bad behaviour, based on the claim they came from supernatural authority, may have had survival value long ago when we lived as primitive small tribes struggling against harsh Nature and the hostility of other tribes. Scientific advances and globalisation changed all that, but most human thought remains implacably fixated at the level of the reptile brained Id. It is impossible to become POTUS without public expressions of pious Christian religiosity. Tribal sabre rattling between “leaders” of Nations may well trigger nuclear Armageddon. And why? Because we are governed by fuckwits who were voted in by fuckwits (or who seized power by collusion with fuckwits). It is not my intention to single out Christianity for bashing, no matter how well deserved. I am merely using Christian delusion as one example. Even worse than Christianity (or Islam or Judaism) is the insane theology of the neoclassical, neoliberal economic high priests, who claim that their so-called free market will save us if we just return to growth! Let's put out the fire by pouring petrol over it! Not crazy at all! They and their disciples are the most toxic fracking fuckwits on this planet, even more resistant to scientific persuasion than Il Papa. Notwithstanding the impending demise of industrial civilisation, let us engage in a thought experiment. Imagine that benevolent aliens descend from outer space tomorrow to magically fix our problems. They reset our global population (by some unexplained deus ex machina), painlessly down to one billion people, the survivors being selected randomly. Mr HWAFL (which rhymes with “awful” and stands for “Hairpiece Without A Frontal Lobe”) and his dodgy clan vanish in a puff of flatus. However Mike Pence and Rex Tillerson remain. The aliens restore all ecosystems, resources (including subterranean fossil fuels) and greenhouse gas levels back to the pristine situation of 1850 CE. The aliens declare to the remaining one billion people: this is a one-off reset of humanity, one last chance to fashion a sustainable future for yourselves. You will never again be given such an opportunity. The benevolent aliens will never return. Here's the rub: failure to address the underlying problems of human stupidity and greed will inevitably lead to a re-run of this same failed fossil fool experiment. The remaining humans, the majority of whom are fuckwits, will merely fabricate new or recycle old delusional ideologies to justify their ongoing pursuit of short term greed over long term need, condemning our biosphere to utter devastation yet again. Stupid and greedy humans never learn from history and the majority of humans are stupid and greedy. If it were not so, we would not be facing these planetary predicaments. Our only hope for long term survival is if wisdom and restraint can permanently triumph over stupidity and greed. Only if wisdom and restraint become enshrined in all our policies will humanity have any hope. Humans have held these values before. The Six Nations of the First Peoples of North America formulated such principles. Their time horizon looked seven generations ahead, not at the next quarterly profit. Unfortunately invaders bearing germs (which killed off 95% of the native population), guns and steel all but wiped them out. A few of their surviving descendants still fight at Standing Rock, among the last examples of decent human beings remaining on this planet. Are there any countries today where the sapients outnumber the fuckwits, enabling sane and just social and environmental policy to prevail? Very few, but they exist. Bhutan comes to mind, where the official State policy is gross national happiness. Maybe some Scandinavian countries. In New Zealand my guess is the sp/fw ratio may be as high as 50:50, although I may be wildly optimistic. John Key was a fuckwit who was cunning enough to get out while still able to take credit for the good times. It is possible Jacinda Adern may be a sapient. For the sake of her child I hope she is. In Australia, the fuckwits (=American wannabes) far outnumber the sapients, however there is huge regional variation. Even in America, land of the creeps, home of the knaves and the batshit crazy heartland of fuckwits (creationists, global warming deniers, Chicago school economists, new age antivaccination wackos etc), there are a few pockets of enlightenment. The Pacific Northwest and Hawaii are home to millions of sane, reasonable people who can look forward to a good medium-term future, if only they can find a way to prevent being overrun by fuckwits from the heartland, armed to the teeth with assault rifles and fleeing from “non-existent” climate change (mid-continental heatwaves, droughts, tornadoes etc). Maybe Northern California can build a fence and get Alabama to pay for it. Is there any realistic prospect for the global ascendance of sapience and thus any hope for long term human survival? Actually, yes, there is a tiny possibility. As this century unfolds we will witness the die-off of billions of people through wars, resource depletion, droughts, floods, storms, crop failures, sea level rise (with no place to migrate to), pandemics and numerous other disasters. However several thousand people, perhaps even a million, will survive to the year 2100 and beyond. They will be the descendants of those people living today who were intelligent enough to read the signs of imminent collapse and to plan in advance to cope with the looming catastrophes. The ancestors of future humanity version 2.0 are those few people living right now who are planning to move to a climate resilient location and are preparing their off-grid community homestead to be as self sufficient as possible. As industrial societies fail and central services collapse, the fuckwits, almost all of whom will be living in the cities, will experience severe deprivation and will turn on the clueless sheeple (cs) and on each other like cannibalistic rats. It is possible some outlier fuckwits may overrun some rural homesteads. But not having cultivated the knowledge and skills of self sufficiency and not having built up community trust and cooperation, those invading fuckwits will inevitably die off quickly. In the long term, Nature will select for the sapients who had planned in advance and promoted the values of wisdom, restraint, conservation and mutual cooperation within their small local communities. As time goes by, life will get ever harder, but humans are adaptable and the survival instinct is strong. If the world heats up to the extent that the only remaining survivable location is Antarctica, then humans will migrate to Antarctica. Even if 99% of the (several thousand) surviving communities ultimately fail, all it takes is for a small nucleus of people to survive in the long term, for humanity to get through this genetic bottleneck. DNA studies show such a genetic bottleneck has happened at least once before and it can happen again. Long term human survival depends on the survival of the sapients and the extinction of the fuckwits. Readers of this blog are a self-selected tiny population and (apart from NBL trolls) are very likely to be sapients. As sapients, you are bound to have strong traits of empathy and compassion. However my message to you is this: when the die-off begins, you must not mourn the fuckwits. You must maintain your focus and harden your hearts. The fuckwits will reap what they have sowed. Your responsibility, dear reader, is to save yourself and your family, because the future survival of humanity depends on your survival. Some argue, using sound evidence and logic, that the most probable scenario is human extinction (via multiple mechanisms, climate chaos eventually becoming the worst) by 2100. I do not disagree. Nevertheless I assert that no matter how unlikely long term human survival may be, even if the chance is only one tenth of one percent, failure to at least attempt to survive will be foolish. At the very least you will buy yourself another decade of good quality life beyond the die-off of the fuckwits. There is one former scientist who proclaims with absolute certainty that humans face climate extinction by 2026 – which I have shown using arguments based on physics to be an easily falsifiable hypothesis. That death cult prophet and his parrot-like disciples spew forth an insane ideology of nihilistic, fatalistic, helpless hopelessness (or hopeless helplessness – take your pick). Those misery mongering whiners are no better than the fuckwits. Failure to plan is planning to fail. The time to plan and get organised is now, before descent into chaos deprives you of options and agency. A global population cull is on the horizon and if it selects for sapience then maybe, just maybe, humanity may have a long term future. So how can we awaken potential sapients and encourage as many of them as possible to establish as many offgrid rural homesteads as possible? The first step is to improve and expand awareness of the troubles ahead among the populace. That, dear reader, is where YOU come in. YOU need to organise free community meetings in your location to raise awareness of the troubles ahead and how to mitigate against them. Most will ignore your message, but perhaps one in a thousand may listen and one in ten of those may act. That is what I am doing now and will be writing about next. Even though climate change by itself will not bring down global civilisation within the next decade or two (economic and energy collapse will), climate chaos could kill you and your family right now if you live in a particularly vulnerable area. If you live in a hurricane corridor or mid continental location prone to heat extremes or are already experiencing unprecedented droughts or floods, you need to get the hell out now if you can, while you can. It is the most urgent issue for you personally. Do you remember when there was a debate about climate change? Yes, there was such a thing. Someone would set up a panel where there would be a scientist arguing for the current interpretation of anthropogenic global warming and someone who at least pretended to be a scientist who would argue for the opposite interpretation. It was supposed to be a civil debate, all based on science. I don't have to tell you that such debates have disappeared. You don't see them anymore, just as you don't see quiet and civilized debates between Trump supporters and members of the Antifa movement. In recent times, the closest thing to a public debate on climate was the proposal by Scott Pruitt, EPA's chief, of a "Red Team" and a "Blue Team" of scientists. The fact that Pruitt chose terms commonly used in military exercises says a lot about what kind of "debate" this was supposed to be. Perhaps it is a good thing that the idea seems to have died out. Today, we have no debate, we only have two sides shooting slogans against each other. Each side is ready to exploit every perceived weakness in the other to discharge a volley of posts and tweets aimed at gaining a few political points. A snowstorm demonstrates that AGW doesn't exist while a hurricane that we are all going to die soon. The latest example of this attitude is the news arriving from the Tuvalu Islands. An article by Kench et al., published on Nature, reports that, over the past 40 years, the 101 Tuvalu Islands had gained some area - on the average a little less than 3% - despite the sea level rise that took place during that period. Of course, that generated the usual blast of attacks against "alarmists", for instance by James Delingpole and Anthony Watts. How come that the islands are not sinking? "Global Warming" (written in quotes) must be a hoax. But if we go beyond the noise of propaganda, the story of the coral islands is fascinating and complex. 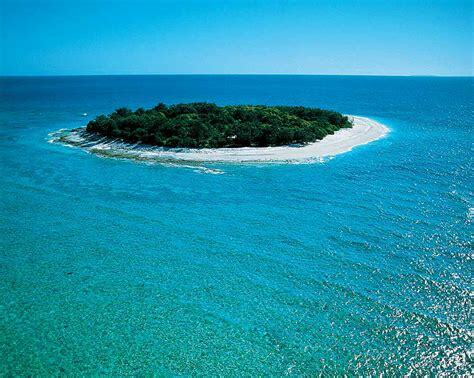 That these islands are not shrinking has been known for at least ten years.The reason is that the islands, or at least the reef barriers around them, are alive. They are not just chunks of rock emerging out of the ocean surface. They are the result of the mineral excreta of tiny creatures that create the hard part of the coral barrier with their exoskeleton. The detritus of the living part of the barrier accumulates on top of it, creating the island. Being alive, corals can grow and follow the vagaries of the sea level - within some limits. They position themselves to stay just below the water surface. If they can't manage that, they can "drown" at depths too high for sunlight to arrive, while they die and are eroded away if they are exposed to air. Some coral reefs survived the great sea level rise (some 120 meters!) that took place at the end of the last ice age. Not a small feat, but it was possible over a few thousands of years. So, there is nothing special in the modern coral reefs having survived the sea level rise of a few centimeters of the past decades. As long as the sea level rise is not too fast, the islands can probably stay above water - perhaps they can even cope better with climate change than some low elevation continental lands. Up until a few years ago, the governments of the coral islands seemed to be determined to make an effort to attract the world's attention to their situation. 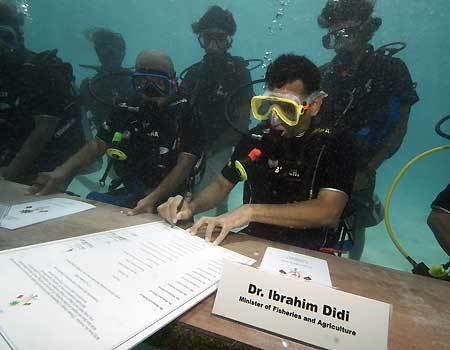 In 2009, the Maldivian government held an underwater meeting just for this purpose. So, given the situation, what is the rational thing for you to do? Of course, it is to sell what you can sell as long as you can find a sucker who will buy it. Then you can say good riddance to those who remain. This 2009 book by Lierre Keith is a fascinating reflection on how ideology permeates people's eating habits. Ideology, then, is based on memes and that's a new and developing field of science. 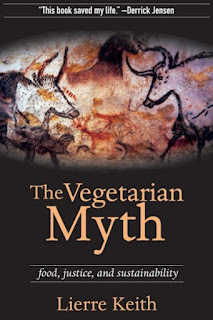 John Michael Greer (the Archdruid) tells the whole story of the great cycle of the macrobiotic and vegan diets. The macrobiotic movement started in the 1970 and peaked sometimes in the 1980-1990s. 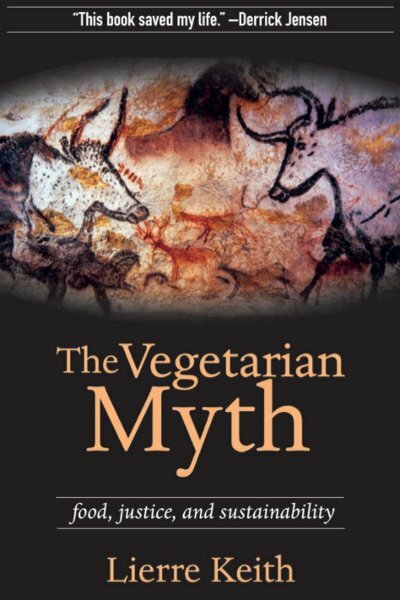 Greer himself tried to follow the rules of the macrobiotic diet and he reports an experience similar to that told by Lierre Keith in her book "The Vegetarian Myth" with a Vegan diet. Both Greer and Keith suffered serious health problems with these diets until they finally decided to abandon them - and then felt much better! You can see how the "macrobiotic" meme went through a classic memetic trajectory, virally infecting the consciousness space of a fraction of humankind. Then, it lost potency and started fading. 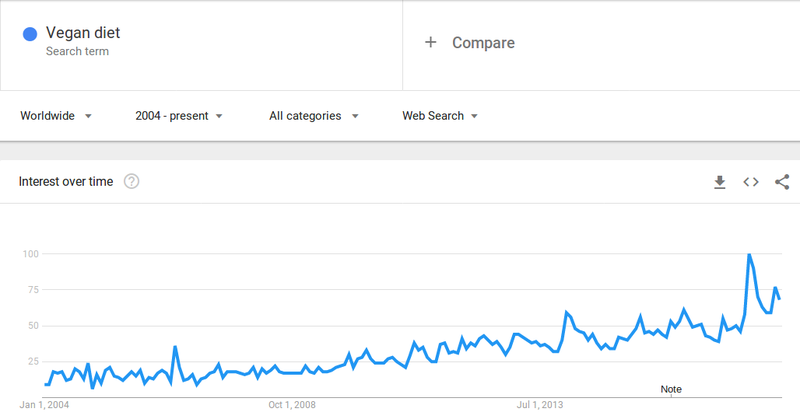 These data are up to 2008, if you use Google Trends to measure how many times the term "macrobiotic" was searched for in the Web, you see that it is in terminal decline from 2004. 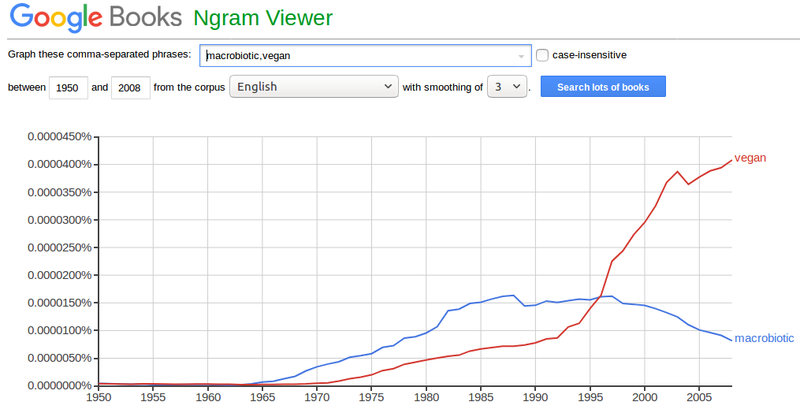 So, veganism is still alive and kicking, but it is hard to say for how long. Most likely, it will follow the same cycle of the macrobiotic meme, peaking and declining in the coming decades. This is not so much related to whether one diet is better than another, or whether either or both diets bring benefits to the people following them. It is the hard law of memes - they have a life of their own and a limited existence time (*). 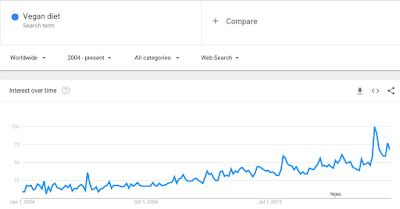 Still, the fact that there is so much interest in diets tells us something. What we eat is not just a question of survival - even though in Italy we have a saying that goes as "what doesn't kill you, fattens you." (**). Rather, what we eat is a cultural, political, and religious statement. Not for nothing, most of the world's religions tell to their followers that God worries about the details of what His sons and daughters eat or do not eat. Today, many people perceive that the world's food industry is operating on the basis of a new kind of religion: the religion of growth. Granted, the growth of food production has been successful in eliminating the major famines that plagued the world up to a few decades ago. But the food industry's approach to feeding the world is, literally, a "scorched earth" strategy. It destroys the soil, kills everything, razes forests, destroys the fisheries, fills the planet with chemicals and more. In the West, the result is the obesity epidemics and plenty of health problem. So, following a diet such as the Vegan one is mainly a political - perhaps religious - statement. A statement that many people feel like they need to make in order to fight the way they are treated by the food powers that be. We'll see more of this in the future and it wouldn't be surprising if a new diet-based religion will arise one day. In the end, food and diets illustrate how difficult it is for humans to understand (let alone manage) complex systems. The human metabolic system is hugely complex and it becomes coupled to the chemistry and the biological activity of food, just as it is interlaced with political and economic questions about the opportunity of using more and more precious resources in order to produce certain kinds of food. The result is a giant confusion of different opinions that may veer all the way to physical attacking people who don't share the same way of thinking about diets. It happened during the 1st century AD and in more recent times it happened to Lierre Keith, attacked by vegan fanatics. Memetics doesn' tell us how to manage complex systems, but it allows us to have some idea of how memes diffuse and fight each other in the human memesphere. So far, we can at least say that dieting memes grow and die as virtual viral entities, apparently independently of whether they are beneficial to people or not. Maybe one day we'll learn how to do better. Keep on trucking? No, Keep on Platooning! The concept of "platooning" involves electronically connected trucks running close to each other. It is a much more innovative idea than that of self-driven private cars and it has the potential of revolutionizing road transport by drastically reducing costs. (image from scania.com). Self-driving cars (or "automated vehicles," AVs) are all the rage in the debate. In most cases, we have a lot of hype and little evidence but it is also true that such cars are not impossible. So, what can we say about this idea? I often say that technological progress is subjected to the golden rule that it generates more problems than it solves. So, not surprisingly, the way AVs are normally proposed today they would solve no important existing problem but would bring new ones. In most cases, you are told that you'll still own a car, use it for commuting, take your family to a vacation - the only difference with AVs is that you are relieved of the drudgery of having to keep your hands on the wheel and your eyes on the road. But a recent study reports that, under equivalent conditions of owning a driverless car, people tend to log in more miles and keep their cars circling around rather than bothering about finding a parking space. Not exactly the way to reduce traffic congestion and pollution. But there is a different application of AVs which may qualify as a true technological breakthrough. It is "platooning." (Image from The Business Times). At first sight, it doesn't look like a big innovation. Trucks running close to each other? Didn't that already exist under the name of "trailers"? There is a breakthrough here, and it is a big one. First of all, platooning doesn't need the massive complication of a completely self-driving car. A platoon of trucks is still supposed to be controlled by humans - what is needed for platooning are sensors and actuators coupled with some computing control. Then, of course, you need safety tricks to ensure that a "de-platooned" truck doesn't run awry, but that should not be a problem. Platooning is one of those "sweet" technologies that need only existing subsystems to function. Then, the advantages. A minor one is that a platooned truck has a lower aerodynamic resistance. But this is peanuts in comparison to the real advantage of the scheme: saving on the cost of personnel. The platooned trucks simply do what the first truck does, there is no need for every truck to have a driver. So, connect two trucks together and you halve the number of drivers needed. Connect three or more, and you proportionally reduce the cost of the human drivers. Now, according to a recent study of the American Transportation Research Institute (ATRI), the cost of drivers represents 40% of the total transportation cost per mile (p. 24 of the report). You see how big the change could be just in terms of reducing the number of drivers. But there is more. Right now, there is no interest in slowing down trucks in order to save fuel because the cost of drivers rises proportionally to the number of hours traveled. But for platooning it makes sense to slow down the whole train and reduce fuel costs. Slower trucks also bring fewer accidents and consequently lower insurance costs. Slower speeds also allow using smaller engines and simpler technologies. And that would also reduce the need for maintenance of roads and bridges. All these effects come together in bringing costs down. 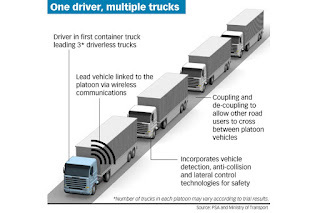 So, platooning is a big innovation. But it must be seen in light of the evolution of the whole society. Alice Friedemann has argued in her book "When Trucks Stop Running" that trucks are a critical element of the way modern society function. Will we have sufficient resources to keep trucks running in the future, platooning or not? Surely, a complete societal collapse generated by resource depletion or runaway climate change would necessarily ensure that the transportation system would collapse, too. But platooning could make trucking much more resilient. If trucking were to use less energy, trucks could be made to run on electric power provided by batteries or by overhead wires. Current rubber tires are made from petroleum but if the trucks slow down we won't need so much rubber as we do today and rubber synthesized from biological sources could do the job. The same is true for the asphalt of roads: slower trucks would place a lower strain on road surfaces and we might go back to "Macadamized" roads. So, platooning is an innovation that we shouldn't ignore. And, as usual, it will have important impacts - not necessarily good. Substantially lowering the cost of road transport will make it more competitive in comparison to rail. This could further marginalize the already marginal role of railroads in freight transportation. Then, nothing prevents from platooning also buses or other kinds of vehicles, also reducing transportation costs. That might mean the end of railroads, except for high-speed trains where road vehicles can't compete. But the truly major effect of platooning is on employment. In the US alone, there are more than 3.5 million truck drivers. Trucking is the most popular medium-skill jobs still available in most of the industrialized world. Platooning may create millions of unemployed drivers. How society will react to that is hard to say, but the shock is likely to be felt. As usual, we move into the future driven by enthusiasm and by the idea that better technologies automatically mean better life. Platooning is just one of the new technologies which may lead us to some direction that we might not have wanted to take. But we will. An intriguing post by Ilaria Perissi on her blog "boundaries" where she examines in depth the relation of painting and modeling - the latter in the modern sense of using mathematical tools to describe the behavior of complex systems. 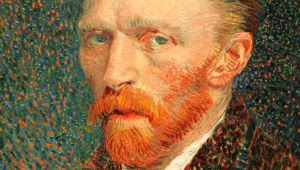 She goes in depth into describing how Vincent Van Gogh and how his paintings can be seen as models of the world. An excerpt from her post is below, but do read the whole thing; it is fascinating! The image of the world around us, which we carry in our head, is just a model. Nobody in his head imagines all the world, government or country. He has only selected concepts, and relationships between them, and uses those to represent the real system – Jay Forrester (1971). Could these sentences represent also a painting process? Is a painter a sort of modeler? Following the rational of previous words, most of the painters are interested in reporting an image of the world and the paintings are just models of that images, including both the material world as well as the rapresentation of feelings and situations; they are not models of the whole world, but of a set of selected concepts and relationships used to represent a real material system, which could be a landscape, a still life, a portrait, a situation or event, as wars, battles, a sunset or a ‘starry night’, ‘potatoes eaters’ and representation of feelings as in the painting 'Sorrowing Old Man' or 'Two lovers'. Rread the whole post at Ilaria Perissi's "Boundaries"
What if we could REALLY convince the public that climate change is a threat? Maybe one day some really gigantic-awful-horrible-monstrous-humungous climate related disaster will hit us. And that, at that moment, people will stop playing the boiling frog and will be forced to admit that climate change is real and we have to do something about that. Unfortunately, plenty of gigantic-horrible-etc. disasters have already hit us, but the public doesn't seem to have taken notice. But never mind, we might be hit by the really big one. And, if it happens, do you think people will come to the scientists and tell them "we are so sorry, now we understand you were right all along"? I have the impression that it will be rather something like what you see in the clip, below. It will be something like what the woman says, "God is going to destroy this Earth and there is nothing you silly scientists can do about that with all your scientific blah-blah." And I have this terrible feeling that she may be right. Above, you can see an image from the paper by Marsicek et al., just appeared on Nature. 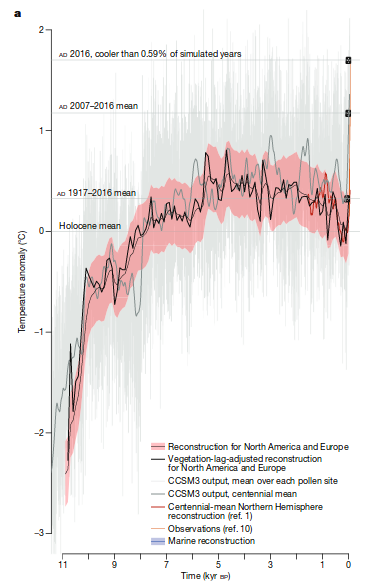 It shows a reconstruction from pollen records of the temperatures of the past 10,000 year or so, the "Holocene," for North America and Europe. Note the black squares, showing how fast temperatures have been growing during the past 50 years or so. As all reconstructions of the past, this one has to be taken with some caution, but it fits well with the various "hockey sticks" that research continues to produce despite the attempts to discredit both the science and the scientists who work in this field. So, we can assume these results to be reasonably reliable. Then, we can note a few interesting things. 2. Civilizations seem to grow and collapse because of internal factors - the fall of empires doesn't seem to be correlated to climate change. For instance, you can look in the graph for the data corresponding to the fall of the Roman Empire, between 2000 and 1500 years ago. Temperatures are flat, at most cooling a little. It is a point that I already made on the basis of another set of data specific for the region occupied by the Roman Empire. These more detailed data show a cooling period in Europe, but after the fall of the Empire. 3. Some relatively intense oscillations in the curve appear at about 3000 years bp, which corresponds to the collapse of the Late Bronze Age civilization. This might support the interpretation by Eric Cline who sees climate as a concause of the collapse. Maybe, but can a whole civilization collapse abruptly as the result of a temperature change of just a couple of tenths of degrees? Personally, I tend to think the opposite. That is, the modest temperature change of the Late Bronze Age has been triggered by the collapse of the Mediterranean civilization of that time. 4. Note how some much touted events of the past - for instance the "Medieval Warm Period" - appear as just minor perturbations in the curve. Overall, it seems that the effect of human activity on climate has been marginal until the age of fossil fuels. 6. There is no obvious correlation of this long term trend with what we know of the Sun's output. There has been a lot of speculation that the past temperature oscillations have been related to variations of the Sun's output -- the "Maunder Minimum" is an example of that. But if these variations have an effect, it is truly minimal. It can only be within the oscillations of the curve which don't exceed a few tenths of degree. 7. The increase in temperatures during the past 50 years or so has been simply stunning. In a sense, these sudden temperature changes are not unusual in the earth's history (the problem for biological species is to survive them). But, in this case, it is so fast that it has probably no equals in the whole geological history of the planet. It is a disaster ongoing. Will civilization survive? Will humankind survive? Will anything alive today survive? Who can say? But don't worry: we all know that this paper is part of the great conspiracy of the 97% of the world's climate scientists. Fortunately, they have been debunked by a group of brave internet trolls, helped by friendly fossil fuel lobbyists. The paper cited here is behind a paywall. If you have no access to it, write to me (ugo.bardi(twiggyingthing)unifi.it) and I'll send you a copy.